The All New TracVision A7 - Making TV as Mobile as You Are! Leave the DVDs and videotapes at home and instead enjoy up to 185 channels of DIRECTV service and your favorite local channels* on the open road. ** The all-new, ultra-low-profile TracVision A7 from KVH sets a new standard for fun on the road with live DIRECTV programming right on your car’s video screens. And for the first time, you can take your local channels with you – don’t miss that big game, traffic report, or breaking local news story again. Traveling in your car has never been this much fun. Now your family and friends can enjoy the DIRECTV service that they watch at home while in your car. It’s true…the best seat in the house is now in your car! * Subject to local channel availability and satellite accessibility. Click here for more details. ** TracVision A7 provides full in-motion reception of satellite TV signals on open roads with a clear view of the TV satellite in the southern sky while in the continental U.S. TracVision A7 is intended to provide programming only on screens that are not directly or indirectly visible to the driver of the vehicle when the vehicle is in motion. † DIRECTV service packages for cars differ from standard home packages. Programming, pricing, terms and conditions subject to change without notice. + U.S. Design Patent # D-493164 | Euro Design Patent # 000050877-0001. The TracVision A7 is covered by one or more of the following patents. Receiver Dimensions 11.7" x 11.4" x 3"
High-speed MSN TV Internet in the high-speed lane? Absolutely! Broadband Internet in cars is a reality thanks to Microsoft’s MSN® TV and KVH Industries. Now you can enjoy high-speed Internet access on your in-car video monitors while you are on the go! Whether you want the latest news, sports updates, or streaming audio and video for your family to enjoy on those long road trips, the TracNet 100 makes all of this and more easily accessible. With a receiver small enough to hide under the seat, a convenient wireless keyboard and remote, and a 3W signal booster and external antenna for extended range, KVH has created the easiest way to stay connected on the road. 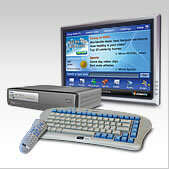 TracNet 100 offers a computer-free connection to MSN TV Internet service, which is optimized for display on virtually any TV screen, making it a brilliant solution for Internet in cars. Thanks to high-speed EVDO cellular data service, you’ll enjoy on-the-go connections to web browsing, MSN Mail and Messenger and access to Windows Media-compatible music and video from the Internet or your PC. And for those of you who want to get online using your laptop, TracNet 100 also includes an integrated WiFi hub to support you and your passengers anywhere in your vehicle. † EVDO (Evolution Data Optimized) data service is available in more than 180 cities nationwide, with new cities being added on an ongoing basis. When EVDO service is unavailable the system will default to 1XRTT service, which delivers speeds of 60-80 Kbps and bursts up to 144 Kbps. TracVision - connecting you to the entertainment and news you want, virtually anywhere you go. Weight 28 lbs. 33 lbs. 33 lbs. † Requires HD receiver and may require DIRECTV optional HD converter. * For complete regional coverage capabilities, visit the TracVision Satellite Coverage page. Small. Simple. Powerful. The New TracVision R6. The revolutionary new TracVision R6 sets a new higher standard for premium automatic in-motion satellite TV. Keep up to speed with 300+ channels of programming – news, weather, sports, movies, XM radio music, and more! 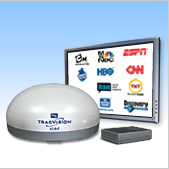 The TracVision R6 is the system that truly makes satellite TV easy, fun, and reliable in an RV or houseboat! 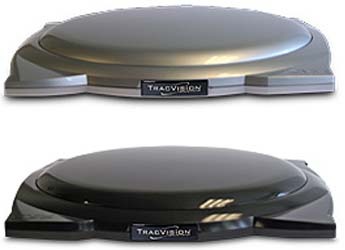 Sleek and low-profile (12.5" high), the TracVision R6 looks great and is so quiet you won’t know it’s on!! Simple to install with a single-cable installation and user-friendly setup that anyone can do. The TracVision R6 includes the industry’s first integrated 12V satellite receiver and fast, foolproof GPS-assisted DVB® satellite acquisition and switching. Our breakthrough antenna technology includes DewShield™ – KVH’s new electronic dew elimination system – to provide unsurpassed reception compared to competitive systems! Plus, TracVision R6 comes with an exclusive GPS-based geo-location feature for faster satellite acquisition and future mobile access to additional DIRECTV® programming. Want to use multiple receivers and a DVR in your RV or motorcoach? Use our TracVision R6 System Configuration Wizard to assist you with these more complex installation configurations. Access to 300+ channels of satellite TV programming – news, weather, sports, movies, XM radio music, when parked or on the move! † High-definition programming requires an HD-compatible receiver (sold separately) and may require KVH's DIRECTV optional HD converter. The best in-motion satellite television system with integrated DVB® technology for value-oriented customers. Whether you’re parked for the night or cruising down the highway in your RV, motorcoach, or truck, TracVision R5 brings you hundreds of channels of uninterrupted, crystal-clear digital satellite TV entertainment. With unsurpassed DVB satellite acquisition, automatic satellite switching, and proven, reliable performance, the new TracVision R5 offers tremendous versatility and value for people on the go. Significantly more powerful than competing systems, it brings uninterrupted, crystal clear digital entertainment to trucks, motorcoaches, and RVs. No matter where you go, the TracVision R5 is the best value of any in-motion product available today. Access to hundreds of channels of satellite TV programming – news, weather, sports, movies, satellite radio2 (where available) or more when parked or on the move! 1 High-definition programming requires an HD-compatible receiver, sold separately. In order to receive high-definition programming from DIRECTV satellite at 110°W, extra hardware is required, sold separately. 2 Satellite radio is available with select satellite TV providers. 3 DIRECTV and DISH Network subscribers who use multi-satellite service, may need a KVH TV/SAT switch to select between satellites. The best value in domed stationary satellite TV antenna systems with integrated DVB technology. You can miss an exit. But miss your TV? Bring along all your favorite shows, and with the flick of a switch, add variety to every trip you take using TracVision R4 satellite TV system. Crank up the volume, not the antenna. 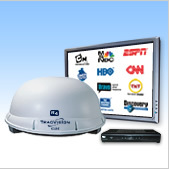 Protected under its dome, the TracVision R4 is ready to go whenever you stop. The news and entertainment you want comes easily with the TracVision R4 stationary satellite TV system, which offers integrated DVB technology and fully automatic satellite acquisition. The TracVision R4 delivers the same strong reception as the in-motion TracVision R5 and is ideal for use aboard parked RVs, trucks, motorcoaches, 5th wheels, and towables. Park it and see. Don’t miss a thing. Access to hundreds of channels of satellite TV programming – news, weather, sports, movies, satellite radio2 (where available), or more when parked! 1 High-definition programming requires an HD-compatible receiver (sold separately) and may require KVH's DIRECTV HD optional converter. In order to receive high-definition programming from DIRECTV satellite at 110°W, extra hardware is required, sold separately.